Five Kenyan girls from Kisumu City Ivy Akinyi, Purity Achieng, Stacy Owino and Synthia Otieno are to be flown to Google headquarters in California, U.S.A, after inventing “I-cut”, an app to end Female Genital Mutilation, FGM. They have a chance to win Ksh 1.5 Million if they win. 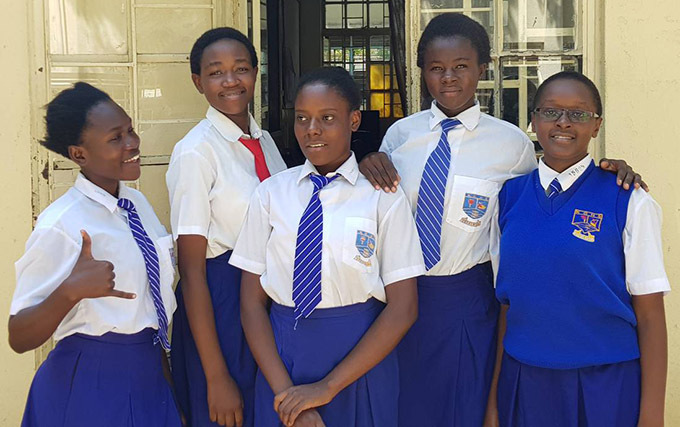 Organisers say the five teenagers, aged 15 to 17, are the only Africans selected to take part in this year’s international Technovation competition, where girls develop mobile apps to end problems in their communities. “FGM is a big problem affecting girls worldwide. It is a problem we want to solve,” Stacy Owino, one of the contestants told the media, before flying to the U.S. on August 6. She said the experience will change their lives. “Whether we win or not, our perspective of the world and the possibilities it has will change for the better,” Owino said. UNFPA says one in four Kenyan women and girls have undergone FGM, which involves the partial or total removal of the external genitalia, even though it is illegal in the East African nation. UNICEF also said that 200 million girls and women alive today in 30 countries around the world have been subjected to FMG, a range of procedures that can cause extreme physical and psychological pain, prolonged bleeding, HIV, infertility and death. Met the ‘Restorers’ five brilliant young students from Kisumu Girls High School. They will be flying to Google HQ in California on August 6th for their I-cut app that seeks to end Female Genital Mutilation (FGM). Kenya is the only nation in Africa selected to take part in this year’s international Technovation competition.